Using our specialized techniques and procedures, we've put our professional skills to the test for you and your nails. A gel lacquer made by CND for the longest lasting "polish" job. Shellac's thin application allows for the most natural look and lasts up to two weeks with no chips! Using a pharmaceutical grade adhesive and physician's formulated glue, Novalash eyelash extensions is the only system in accordance with FDA recommendations. Dinair airbrush make-up is one of the leading products available today. Created by a professional make-up artist, this product has been used for over 25 years by film and TV make-up artists. Former Hollywood make-up artist Mary Piper brings her artistic style to life with permanent cosmetics. This service is for anyone that desires a real enhancement to their own natural beauty. This procedure stimulates your skin's cellular proteins, triggering it to regenerate collagen fibers which fill in any skin irregularities. 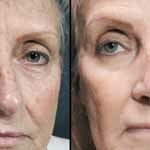 Tattoo dermal rejuvenation leaves the skin feeling and looking younger.